It's not everyday you walk into a store and find a toy you never even knew was coming if you are a fan living in this age of constant information. But it happened. 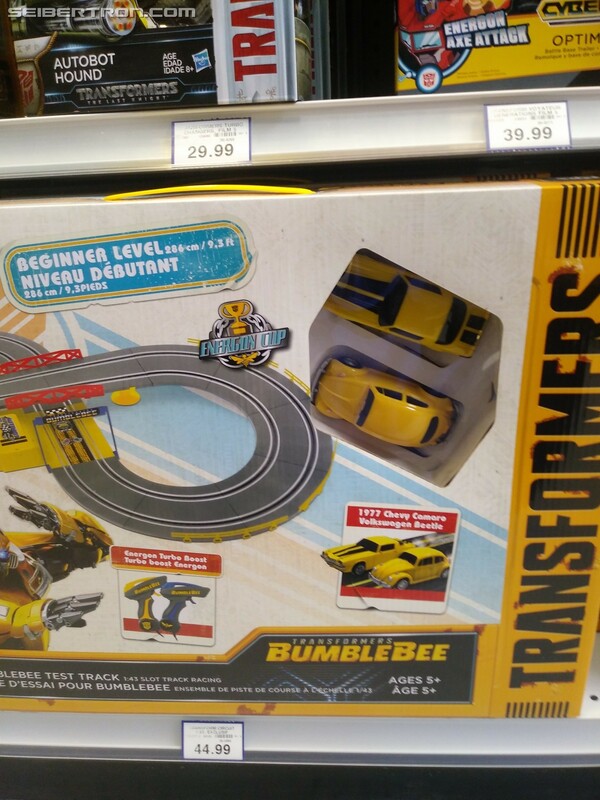 When walking in the Transformers aisle at my local Toysrus in Montreal Canada, there was a whole new area of shelf space dedicated to the Bumblebee Test Track, a toy that was never brought to anyone's attention before. 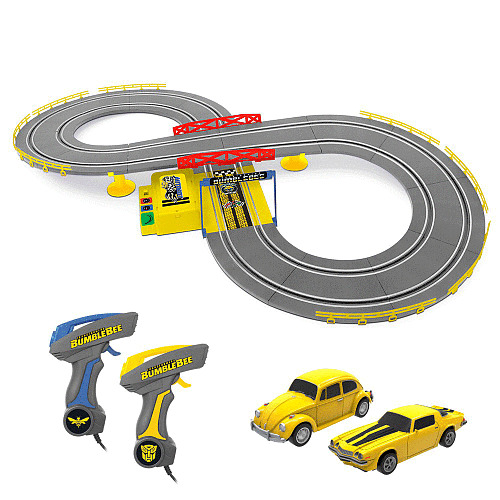 This is a figure 8 track for young kids to race radio controlled Bumblebee cars. It comes with Bumblebee both in his Beetle mode and Camaro mode. The price was $44.99 CAD (a little over $30 USD). If this interests you or your kids, you might want to stop by your local big box store since it being found in one place in North America means it is shipping out to all retailers. 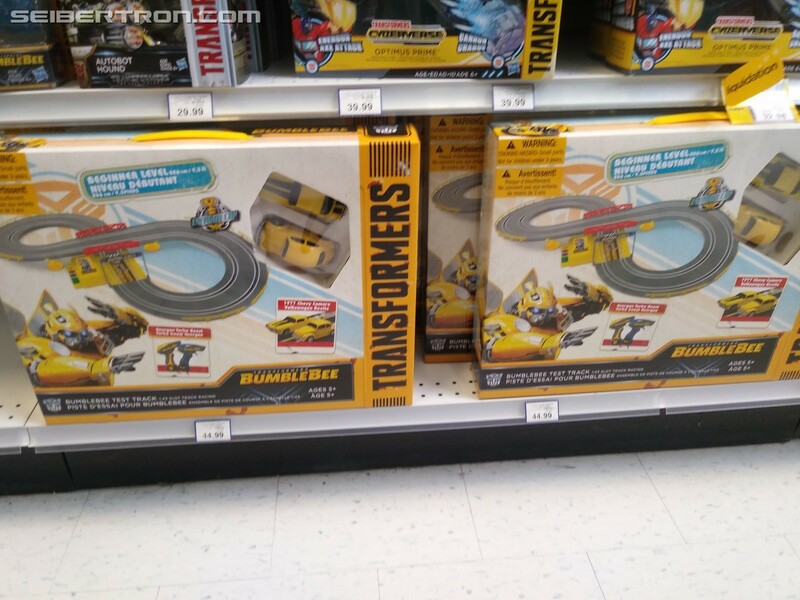 You can see images of the product below along with the product listing from Toysrus.ca. Challenge your friends to the ultimate high-octane race with this Transformers Bumblebee 9.3ft beginner set! 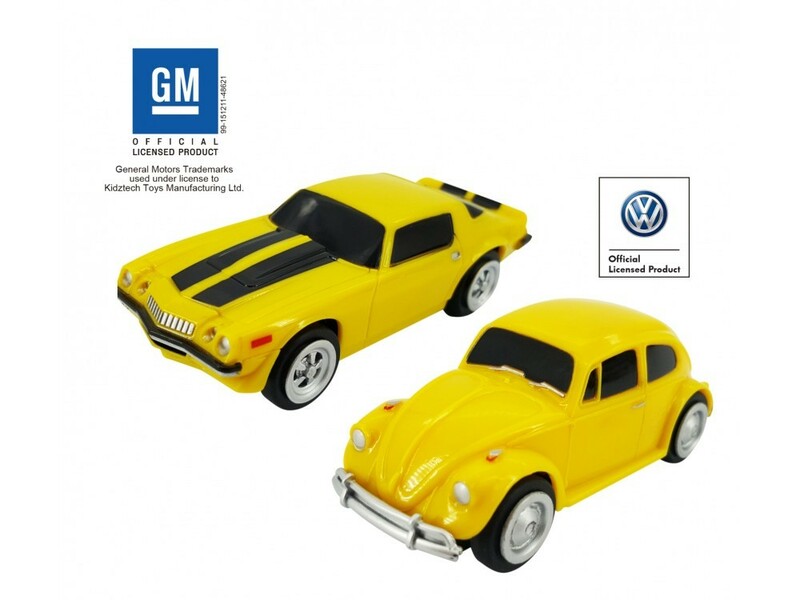 Each set includes 1 track set, 2 Transformers Bumblebee slot cars with working headlights and 2 wired controllers with turbo function. The track assembly is required and 6 x AA batteries are not included. Age 5 years and up. Track length: 286cm/ 9.3ft (Beginner level). 2 slot cars with working headlights. 2 wired controllers with turbo function. Track assembly is required. 6 x AA not included. Eh I prefer the 2007 Scaletrix set (that I won from Titans Magazine's Transformers mag here in the UK) where you Bumblebee racing Barricade and both cars have simplistic robot forms they can change into. Racetracks are still a thing in these days and age? I find it kind of awesome actually. Those of you eagerly anticipating the second wave of the Bumblebee movie Speed Series figures (serving as the Legends/Legion Class size for this line) will be pleased to know that it has been found at retail! More specifically Cliffjumper, who is the only new figure in this second and final wave. And, as is often the case with Cliffjumper toys, he's simply a red redeco of a Bumblebee toy, in this instance, the Volkswagen Beetle mold of 'Bee from Wave 1. Coincidentally this echoes the previous Cliffjumper Legion Class toy from the 2007 movie, who was a straight redeco of that line's '76 Camaro mold. 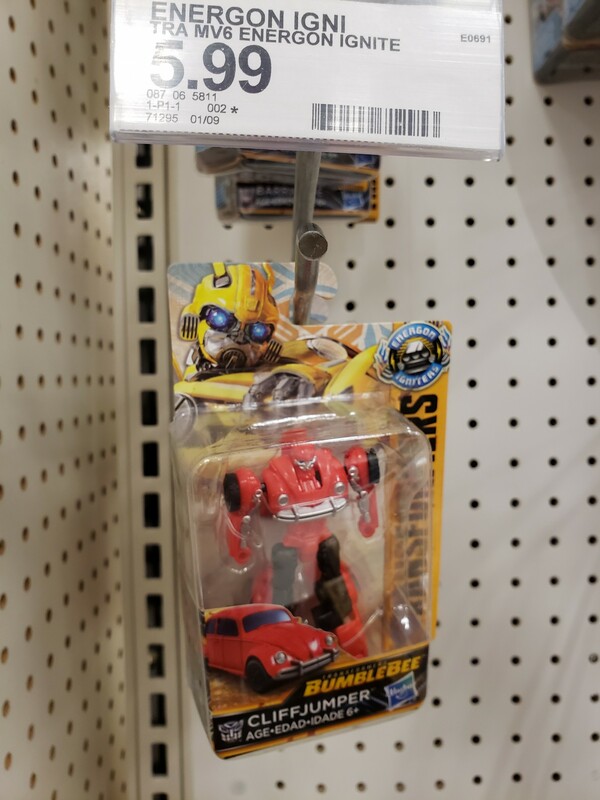 History lesson aside, Cliffjumper and the rest of his wavemates were found at a Target in Salt Lake City, Utah. Will you be on the lookout for this figure? Let us know what you think, and if you've found a newly released figure, but haven't seen any news on it, be sure to email us with photo evidence. Happy hunting! Funny, i was going to take a photo last week when i saw two at a local target here in Virginia. I actually have a photo, I took it like a week or two ago. I would have posted it but then again, everytime I try to upload it won't work. Maybe I should upload to Facebook and put a link there? Nathaniel Prime wrote: I actually have a photo, I took it like a week or two ago. I would have posted it but then again, everytime I try to upload it won't work. Open a IMGUR account. Upload the picture there. Then copy the BB code and paste it here. They are reliable and will most likely not turn into Photobucket any time soon. I was betrayed by Photobucket like so many others. Then I used another service that went bankrupt. So I understand the sentiment wholeheartedly. I've never really used Photobucket or Imgur. When I've sighted a figure in the past, I've just taken a picture with my phone and attached it to an email. That's always worked for me. Saw one here in Nebraska on Wednesday. Movie stuff arriving on time, yet again, to an area that has horrible timelines/distribution for every other subline. Well this is disappointing. I was hoping for at least one more wave of Speed series figures. 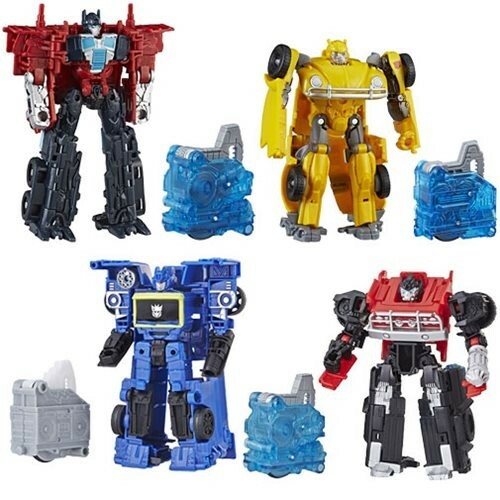 I guess Dropkick, Blitzwing, Ratchet, Ironhide and Soundwave are it for those series' as well. Say what you want about the Bumblebee toyline but the toys were at least on shelves when the movie was out and now every single toy has been accounted for before the film comes out on Blu Ray April 2nd. A few toys have come out since the film was released in theatres like Nitro Series Dropkick and Blitzwing and the Mission Vision toys and fellow Seibertronian newsie D-Max has found the only ones still unacounted for at brick and mortar: Transformers Bumblebee Evergon Igniters Power Plus Series Ironhide and Soundwave. While he only found Ironhide, we know that the more coveted Soundwave is in the same wave and was probably bought on sight by someone else who loved that van mode. You can see the case distribution below. While they were available at Target.com, this is the first time we hear about them being found in stores. These toys were found at Target, Altoona, Pennsylvania. Ironhide was $14.99. All the toys in a line appear at U.S. Retail? Has this ever happened before? Usually there's one or two that have very limited distribution and some don't show up in the U.S. at all. Decepticon Stryker wrote: All the toys in a line appear at U.S. Retail? Has this ever happened before? Usually there's one or two that have very limited distribution and some don't show up in the U.S. at all. In a movie line, I dont think so, hence why I wanted to write this story. It did happen with POTP though. These where at a Target in Chester, VA! I posted this in the Toy Sighting Forum for Virginia. Well all in all I think this line was really fun and I hope the igniters gimmick is something that continues on. Pouring one out for the homies. 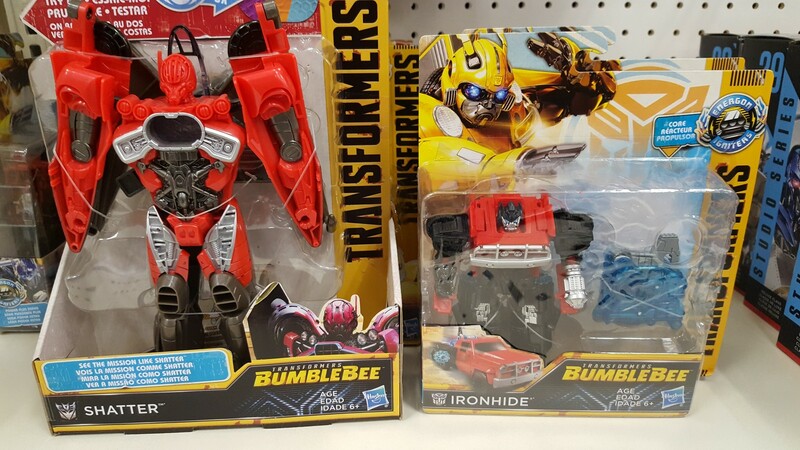 Looking for some interesting exclusive merchandise from the Transformers: Bumblebee movie? 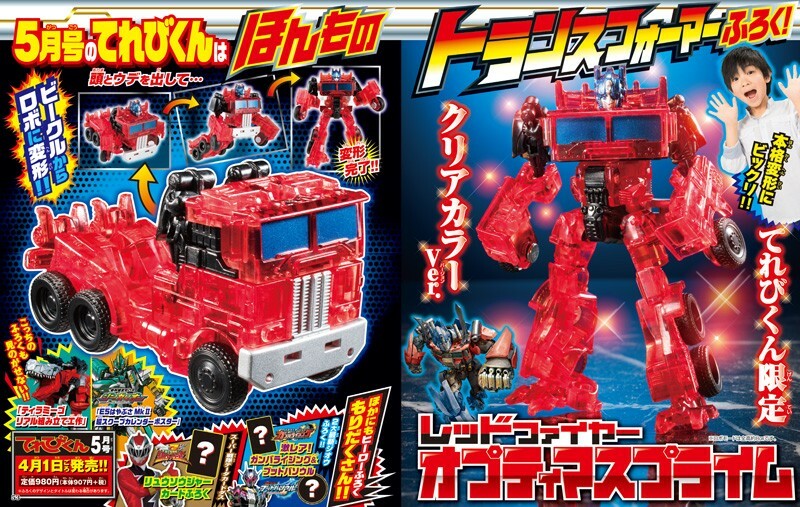 Japanese publication TV-Kun may have what you're looking for in the form of their newly announced "Red Fire Optimus Prime" exclusive figure! This figure is a clear red plastic "repaint" of Energon Igniters Speed Series Optimus Prime. Black Convoy of TFW2005 has translated the press release from TV-Kun's website, which details that the figure is tied to the May 2019 issue of TV-Kun magazine and will debut for the Japanese market on April 1, 2019 at the price of 980 JPY. Below is the image from the press release on TV-Kun's website for your reference. What do you make of this Japanese exclusive figure? Do you love all things clear plastic in your Transformers? Does this figure seem worth the effort of importing for fans outside of Japan? Let us know in the comments below, and stay tuned to Seibertron.com for the latest news on all things Transformers! 4,057 pages were recently viewed by 561 unique visitors. This page was viewed 1 times on Thursday, April 18th 2019 5:59am CDT. © 2019 Seibertron, Inc. DBA Seibertron.com. All Rights Reserved. Established June 2000. Seibertron.com is owned by Ryan Yzquierdo.